Taoiseach Leo Varadkar has said that it is up to the UK to "square the circle" of avoiding a hard border in Ireland and pursuing global free trade deals outside the sphere of EU regulation. Speaking to CNN, Mr Varadkar said that a hard border could be avoided either through a new EU-UK partnership or through a "unique solution" for Northern Ireland. 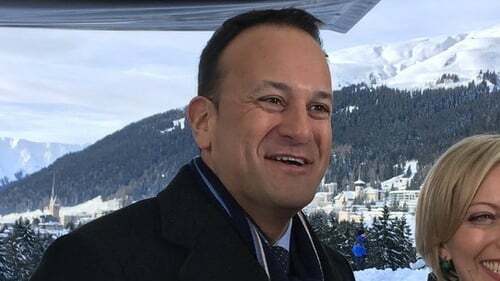 The Taoiseach made the comments during an interview in Davos as the World Economic Forum drew to a close. Asked by presenter Richard Quest how the apparent contradiction between avoiding a border and the demands by the pro-Brexit camp that the UK stay outside the single market, the Taoiseach said: "I would humbly suggest that it is for the people who are leaving to square that circle, and not others. "One way that it could be done, for example, is through a new EU-UK agreement, a new partnership that in many ways may not be the single market but could be very similar to it." Mr Varadkar had yesterday alluded to a "Norway-plus" model for any deal. The Taoiseach added: "Or, it may not be the customs union but it may be very similar to it, to replicate what's there already, in terms of regulatory alignment. "But politics is the art of the possible." When suggested that the agreement on avoiding a hard border was a "fudge" that would "disintegrate a year later", Mr Varadkar said: "It is my job and the job of others to make sure that doesn't happen. "It can be done in two ways. A new relationship between the EU and the UK that replicates the single market and the customs union, or it needs to be a unique solution for Northern Ireland." When the interviewer said that would "not play well" with the DUP, the Taoiseach replied: "It might play well with the majority of people in Northern Ireland who perhaps would see the advantages of having it both ways. "If there's any part of the United Kingdom which actually can have flexibility and can have the benefits, it is Northern Ireland." Mr Varadkar also said that the US retreat from globalisation "concerned" him. "If you look back historically every time the United States looks inward, every time it engages in protectionism, or disengages from the world, the world becomes a less safe place." Separately, the Minister for Finance has said that he has been emphasising the legitimacy of Ireland's tax policy at the World Economic Forum. Speaking on RTÉ’s News at One, Paschal Donohoe said he has also been posing the question "Why should competitiveness be just the prerogative of a large country?" He made the point that a small open economy has every right to use policies "to enhance our ability to create jobs" as Ireland has done. He said the reason Ireland is not part of any race to the bottom is because he is not going to be changing it even if other countries are changing theirs. Mr Donohoe said he has been discussing several issues in Davos, like how Ireland's tax codes intersects with other tax codes in countries that it deals with. He said corporate tax collection raises €8 billion for Ireland each year and that is the reason "we have to be careful regarding the future of it".